Hi everyone! 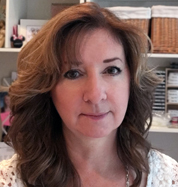 I tried a new (to me) product yesterday that I want to share. 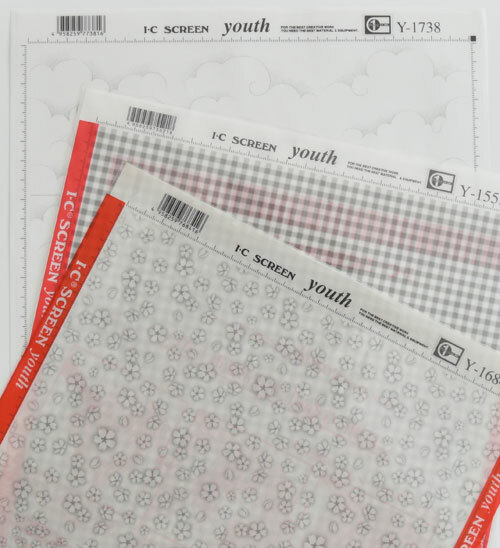 Available in the Imagination International, Inc. store are Screen Tones. In a nutshell, they are clear, printed stickers used to create backgrounds or to cover areas where you might otherwise stamp or sketch in designs. They are transparent, repositionable, can be layered, mixed and matched and are incredibly easy to use! (You can find more detail HERE). 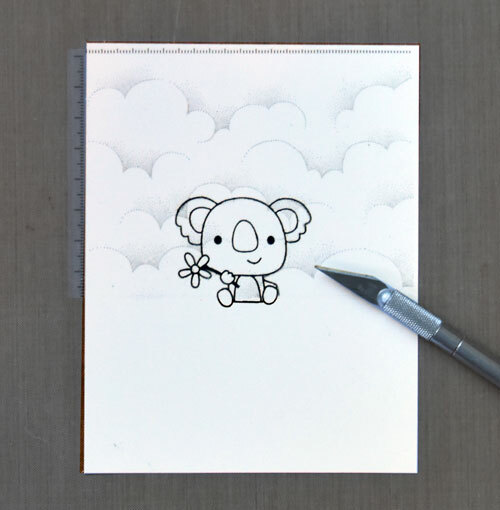 On my card, I paired a Sky Screen Tone with Reverse Confetti‘s cute Bear Hugs koala. 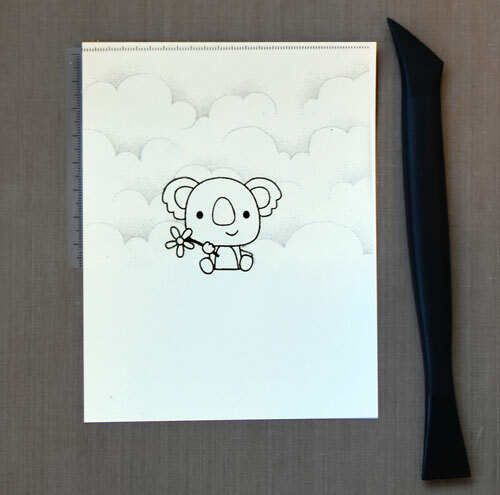 Each screen tone sheet is 12.5″ x 9″ so there is plenty of area for use on many cards. You can check out the (over) 200 prints HERE. They are super easy to use! I first stamped my image onto X-Press It Blending Card then cut a piece of Sky screen tone to size*. After removing the backing, I applied the screen tone over my image, pressing just enough (very lightly) to adhere the sheet over my card stock. I then gently used a kraft knife to cut away the portion of the screen tone that covered my image. My knife blade cut very easily through the screen tone without cutting through the card stock. * It is recommended that the screen tone be cut to size then layed over the image without removing the backing, using a knife to cut away the excess screen tone and then removing the backing and placing the screen tone over the card stock/image. I removed the backing, then cut, using a gentle hand with my knife and it worked fine. If I were using a screen tone on a more artistic/”special to me” piece, I would have followed the adviced instructions, leaving the backing in place to protect my artwork. 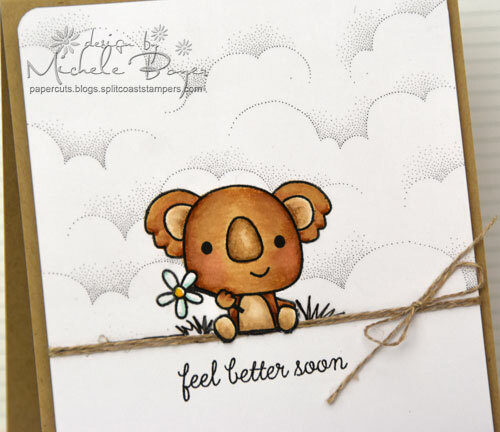 If I had accidentally cut through to the card stock here, I could easily restamp the bear so I wasn’t overly concerned with cutting through (but I tried not to). Once the outline was cut, I used the tip of my blade to peel away the portion of the screen tone covering the image. I then firmly adhered the screen tone to the card stock using a burnishing tool. There are different sizes available depending on the size of the are you want to burnish. You can see all HERE. I used this one. I then colored my image with Copic markers and drew in some grass using a 0.3 black Multiliner. Multiliners can be used on top of the screen but the ink requires drying time or it will smudge. There was a small area of cloud pattern at the bottom left that I did not want so I used a Tone Eraser to easily remove it. I added linen thread to camoflauge the bottom edge of the screen tone and used my kraft knife to cut around the bear’s feet, allowing them to hang over the thread. 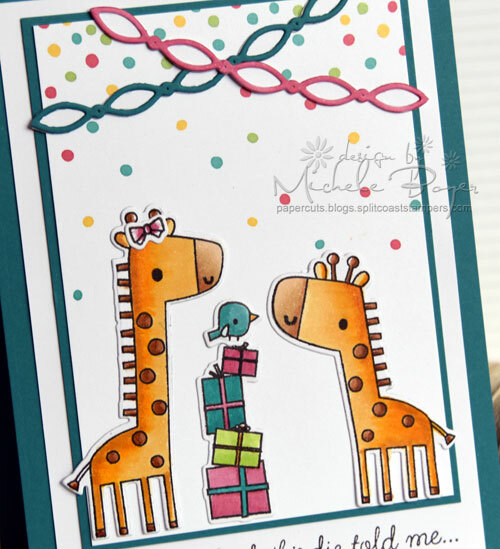 Today I colored cute giraffes from Reverse Confetti‘s Lift Me Up set. Sooo cute! 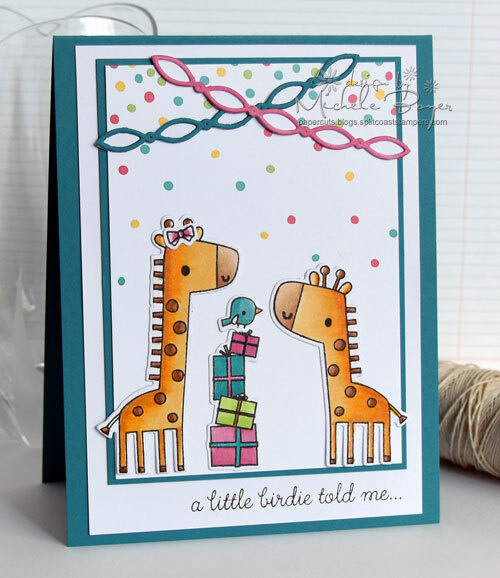 After coloring with Copic’s, I die-cut using Lift Me Up Confetti Cuts, adhered to a Party Time Quick Card Panel and added a couple of Linked Garland Confetti Cuts. If you’d like to see other coloring for the challenge, you can find me on Instagram HERE. Hi everyone! 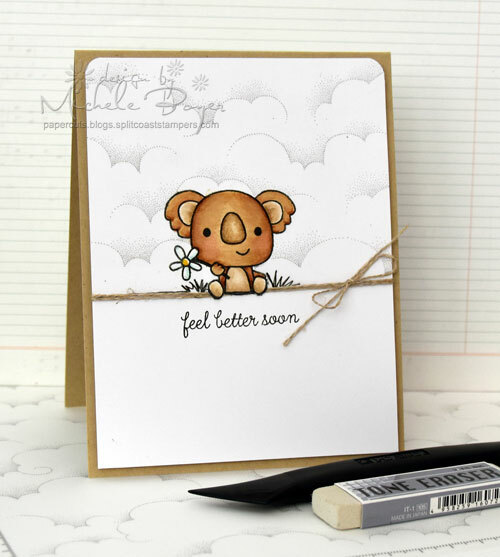 Today I’m using new Bear Hugs stamp set and dies from Reverse Confetti. Oh my gosh, one of the cutest sets ever! I’m also focusing on another technique featured in Intro to Coloring with Copic Markers published by Imagination International. On this post, I featured two-color butterflies. Today I’m coloring wood! The sample in the book uses a weathered wood chair, but the basic principles can apply to a tree as well. I first applied a streaky base coat of E31, moving my marker in the direction of the wood grain (1). Next, I applied E33, holding the marker a bit more upright to apply thinner strokes (2). 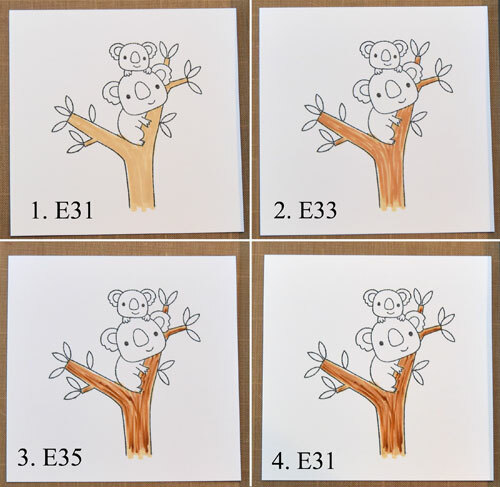 I then held E35 completely upright, using only the tip of the marker to apply lines of color (3). Once the ink was dry, I returned with E31 to blend only minimally (4). In order to leave a white highlight on the bear noses, I carefully outlined each nose with the tip of a W9 marker, drew a line just to the left of the highlight area and filled in the area to the left of the line. I will be back soon with another technique featured in Intro to Coloring with Copic Markers. So many from which to choose!